377 Marlborough is located on the north side of Marlborough, between Hereford and Massachusetts Avenue, with 375 Marlborough to the east and 379 Marlborough to the west. 377 Marlborough was built in 1880 by Vinal & Dodge, masons, for building contractor George Wheatland, Jr., for speculative sale. It was one of three contiguous houses (369-371-373 Marlborough) built at the same time and one of twelve contiguous houses (369-371-373-375-377-379-381-383-385-387-389-391 Marlborough) built for George Wheatland, Jr., in 1879-1881. He is shown as the owner of 375-377-379 Marlborough on the original building permit application for the three houses, dated April 9, 1880 (one application for three houses). 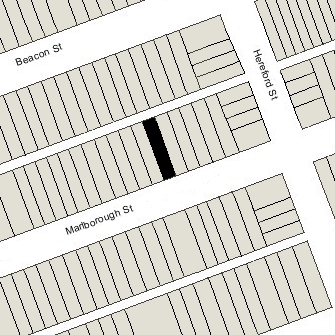 Click here for an index to the deeds for 377 Marlborough, and click here for further information on the land on the north side of Marlborough between Hereford and Massachusetts Avenue. On May 6, 1881, 377 Marlborough was purchased from George Wheatland, Sr., by George Draper, owner of a textile machinery company in Hopedale. He and his wife, Hannah Brown (Thwing) Draper, lived in Milford. George Draper purchased 377 Marlborough to be the home of his son-in-law and daughter, Edward Louis Osgood and Hannah Thwing (Draper) Osgood, who had married in January of 1881. They also maintained a home in Hopedale. Edward Osgood was a publisher in his brother’s firm, James R. Osgood & Co. and later became a banker and an executive with his father-in-law’s firm. On July 18, 1881, George Draper transferred 377 Marlborough into his daughter’s name. 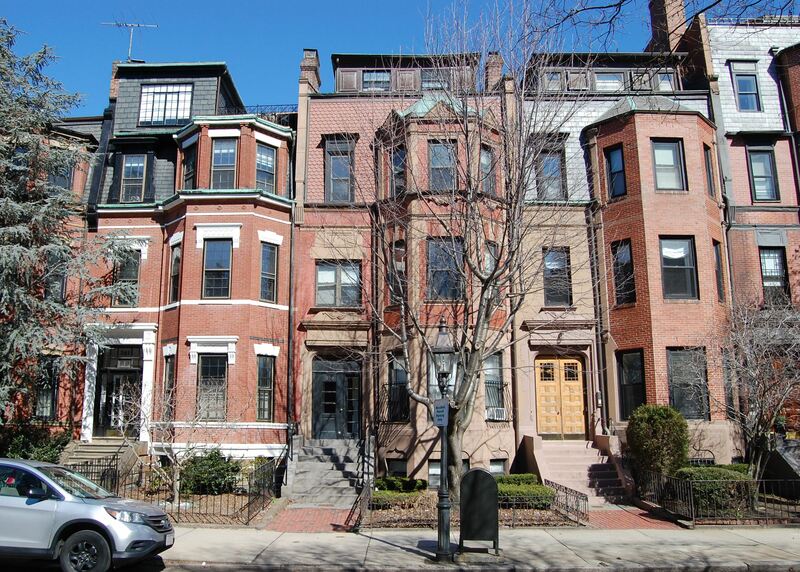 The Osgoods continued to live at 377 Marlborough during the 1884-1885 season, but then moved to Hopedale and leased their Boston home to others for the next eight years. By the 1885-1886 winter season, 377 Marlborough was the home of Isaac Tucker Burr, Jr., a banker and broker, and his wife, Alice McClure (Peters) Burr. They previously had lived at 356 Marlborough. They continued to live at 377 Marlborough during the 1886-1887 season, but moved thereafter to a new home they had built at 410 Beacon. By the 1887-1888 winter season, 377 Marlborough was the home of John Franklin Brooks, a merchant. He was a widower and lived at 377 Marlborough with his two daughters, Frances and Mary Brooks. They previously had lived at the Hotel Vendôme. His mother, Susan Elizabeth (Vanderford) Brooks. the widow of John Brooks, lived with them. Mrs. Brooks continued to live there in 1892, but had moved by 1893 and by 1895 was living in Salem. John Brooks and the Misses Brooks continued to live at 377 Marlborough during the 1892-1893 season, but moved thereafter to 512 Commonwealth. By the 1893-1894 winter season, the Osgoods were living at 377 Marlborough once again. They continued to live there during the 1898-1899 season, but moved thereafter to 221 Beacon. They continued to own 337 Marlborough and lease it to others. 377 Marlborough was not listed in the 1900 and 1901 Blue Books. By the 1901-1902 winter season, 377 Marlborough was the home of Dr. George Hamlin Washburn, a physician, and his wife, Anna Marilla (Hoyt) Washburn. Living with them were his grandmother, Elizabeth (Homes) Washburn, the widow of Philander Washburn, and his aunt, Elizabeth Homes (Washburn) Brainard, the former wife of Charles Rollin Brainard, an Episcopal minister and later a lawyer and author. Elizabeth Brainard was an artist. They all previously had lived at 311 Marlborough. Elizabeth (Homes) Washburn died in December of 1901, and Elizabeth Brainard died in March of 1905. By 1905, Anna Washburn’s mother, Betsey Ann (Barnes) Hoyt, the widow of Stephen Chase Hoyt, was living with the Washburns at 377 Marlborough. She died in January of 1907. In about 1909, the Washburns were joined at 377 Marlborough by his parents, Rev. George Washburn and Henrietta (Hamlin) Washburn. Rev. Washburn had been a missionary and educator in Turkey, where he had served as President of Robert College in Bebek. Rev. Washburn died in February of 1915 and Anna (Barnes) Washburn died in April of 1915. Dr. George Washburn and his mother, Henrietta Washburn, continued to live at 377 Marlborough during the 1916-1917 winter season, but moved thereafter to 238 Commonwealth. 377 Marlborough was not listed in the 1918-1920 Blue Books. By the 1920-1921 winter season, 377 Marlborough was the home of Mrs. Elizabeth Merrihew (Plummer) Grinnell, the former wife of Dr. Francis Browne Grinnell, a physician, and their three minor children: Frederick, Francis, Jr., and Robert. They previously had lived at 402 Marlborough. 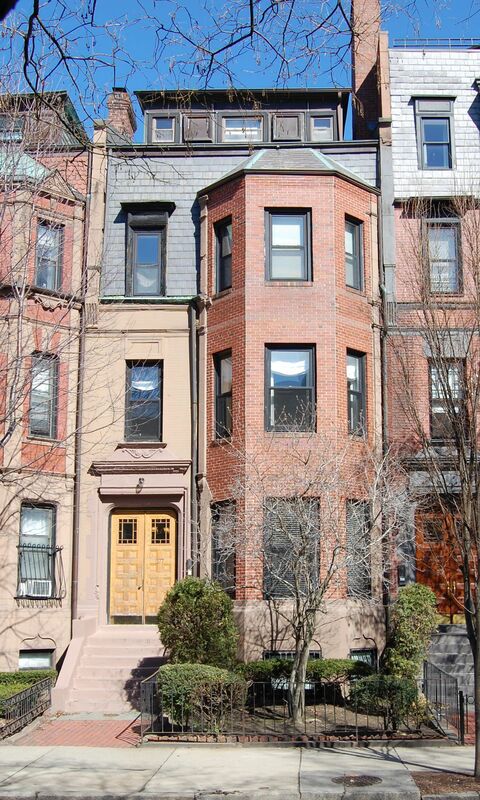 She continued to live at 377 Marlborough in 1923, but moved thereafter to 60 Fenway. On July 30, 1923, 377 Marlborough was purchased from Hannah Osgood by Bessie B. (Taylor) Trimble, the wife of Frederick Leslie Trimble. They lived at 299 North Harvard in Allston. He was a machinist. On January 9, 1924, 377 Marlborough was acquired from Bessie Trimble by Lavinia S. (Deshon) Jackson, the widow of Ernest Colt Jackson. She lived at 107 Mt. Vernon, where she operated a lodging house. She died in 1928. During the 1923-1924 winter season, 377 Marlborough was the home of Amert Walter (Read) Hill Rhodes, the widow of William A. Rhodes, who operated it as a lodging house. She previously had lived at 25 St. Botolph, where she also had operated a lodging house. By 1925, she had moved to 85 St. Botolph. During the 1924-1925 winter season, 377 Marlborough was the home of Mr. and Mrs. Thomas Morgan O’Connor. By the 1925-1926 winter season, 377 Marlborough was the home of Jessie Maude (Raymond) Parker, the widow of George O. Parker, who operated it as a lodging house. She previously had lived at 96 Washington. On July 12, 1928, 377 Marlborough was acquired from Lavinia Jackson’s estate by real estate dealer Harris Wolfe, and on September 29, 1928, it was acquired from him by Bertha Mary (Pope) Smith, the wife of Walter Henry Smith. She and her husband, a sea captain, lived in Miami (they had lived at 36 Fairfield in the early 1920s). In January of 1930, the Building Department issued her a notice of violation, noting that her tenant, Mrs. Parker, was operating a lodging house at 377 Marlborough without the building having adequate egress. In April of 1930, Mrs. Smith filed for (and subsequently received) permission to install fire escapes, indicating that the building was being used as a lodging house. It does not appear that she obtained a change in legal use, but the property was recognized by the Building Department as a lodging house from that time. Jessie Parker continued to live at 377 Marlborough in 1930, but had moved to 379 Marlborough by 1931. On February 6, 1931, Samuel L. Dana, a real estate dealer, foreclosed on a mortgage given by Bertha Smith and transferred the property to his son, Robert D. Dana. On October 23, 1931, Robert Dana transferred the property to the Massachusetts Hospital Life Insurance Company, which held the first mortgage on the property. By 1931, 377 Marlborough was the home Mrs. Florence Olive (Anderson) Varney, the former wife of William Harmon Varney, and her son, Ronald Edward Varney, a theatre manager. She continued to operate it as a lodging house. They previously had lived at 262 Newbury, where she also had operated a lodging house. By 1932, they had moved to 41 Fairfield. On November 9, 1931, 377 Marlborough was acquired from the Massachusetts Hospital Life Insurance Company by Miss Mabel (Maybel) E. Poole, a real estate dealer. On November 12, 1931, the property was acquired from her by Miss Belle Ross. In 1932, 377 Marlborough was the home of Annie Jane (Trimble) Varney, the widow of John R. Varney, who operated it as a lodging house. She previously had lived at 445 Beacon. Annie Varney’s husband and Florence Varney’s husband do not appear to have been closely related. Annie Varney died in September of 1932. After Annie Varney’s death, Mabel Poole moved to 377 Marlborough and probably served as the lodging house manager. She previously had lived in Brookline. Belle Ross also lived at 377 Marlborough during the 1932-1933 winter season but moved thereafter. Mabel Poole continued to live at 377 Marlborough in 1935, but had moved to an apartment at 421 Marlborough by 1936. On August 13, 1935, the Massachusetts Hospital Life Insurance Company foreclosed on a mortgage it held on 377 Marlborough and took possession of the properly. By 1936, 377 Marlborough was the home of Donald C. Brennan and his wife, Sophia Annie (MacDonald) Brennan, who operated it as a lodging house. They previously had lived at 47 Linden. Donald Brennan died in 1939 and Sophia Brennan moved soon thereafter to 213 Beacon. On February 20, 1941, 377 Marlborough was purchased from the Massachusetts Hospital Life Insurance Company by Miss Jennie Latimer, who operated it as a lodging house. She previously had lived at 228 Newbury. She continued to live at 377 Marlborough until her death in March of 1952. On May 2, 1952, 377 Marlborough was purchased from Jennie Latimer’s estate by Bartholomew McCarthy, a retired Boston Edison employee, and his wife, Margaret (Driscoll) McCarthy. They operated it as a lodging house. They previously had lived in Brookline. They continued to live there until about 1967, when they moved to Newton (where he died in September of 1967). On May 3, 1967, 377 Marlborough was acquired from the McCarthys by real estate dealer Joseph E. Coppola and his wife, Susan Frances (Birmingham) Coppola. They lived in Jamaica Plain. He continued to operate 377 Marlborough as a lodging house. In April of 1967, he applied for (and subsequently received) permission to remodel the basement. In October of 1967. he amended the plans to add construction of a “dormer on front section of roof.” It appears that it was at this time that a penthouse story was added to the building. On August 21, 1979, Cheryl Fournier, trustee of the 377 Marlborough Realty Trust, foreclosed on a mortgage on 377 Marlborough and took possession of the property. On August 16, 1984. 377 Marlborough was purchased from the 377 Marlborough Realty Trust by the Brantam Corporation (Branka Milosevic, president). In February of 1985, it filed for (and subsequently received) permission to convert the property from a lodging house into five apartments. On October 28, 1986, Brantam Corporation converted the property into five condominium units, the 377 Marlborough Condominium.